The article presents principal stages of audit of healthcare quality delivered to patients with cardiovascular diseases. The schedule of measures related to every audit stage is presented. Usefulness of the registry of patients with arterial hypertension, chronic coronary artery disease, chronic heart failure and the registry of acute coronary syndrome for purposes of clinical audit in medical practice is considered. Gridnev VI, Kiselev AR. 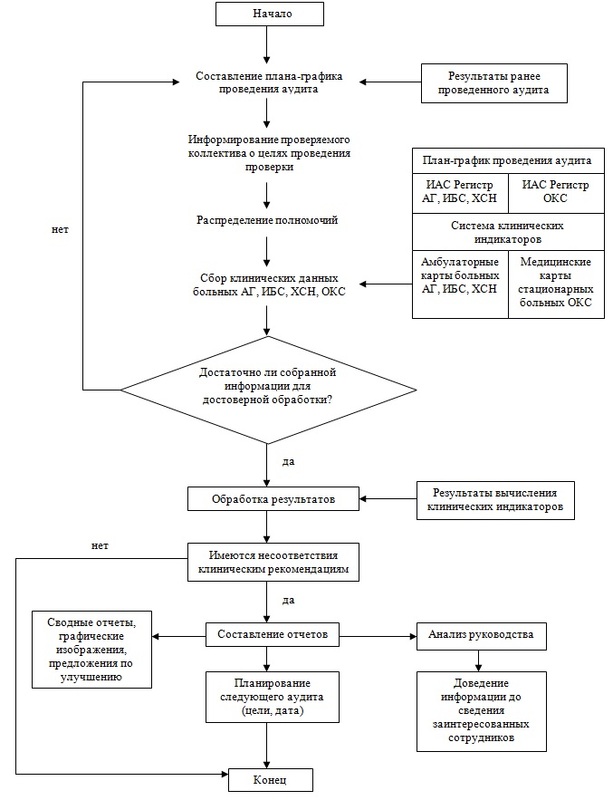 Audit of health care quality for patients with essential hypertension, chronic coronary artery disease, chronic heart failure, acute coronary syndrome: principles of organization, algorithm of implementation. Cardio-IT 2016; 3(4): e0403. Posnenkova OM, Kiselev AR, Gridnev VI. Technology of using of healthcare quality indicators in cardiovascular diseases registries. Cardio-IT 2016; 3(2): e0203. Russian. https://dx.doi.org/10.15275/cardioit.2016.0203. Popova YV, Posnenkova OM, Gridnev VI. System of clinical quality indicators for patients with non-ST segment elevation acute coronary syndrome. Cardio-IT 2016; 3(2): e0201. Russian. https://dx.doi.org/10.15275/cardioit.2016.0201. Posnenkova OM, Popova YV, Gridnev VI. System of clinical quality indicators for patients with ST segment elevation acute coronary syndrome. Cardio-IT 2016; 3(2): e0202. Russian. https://dx.doi.org/10.15275/cardioit.2016.0202. Posnenkova OM, Gerasimov SN. The system of clinical indicators for patients with essential hypertension. Cardio-IT 2016; 3(3): e0301. Russian. https://dx.doi.org/10.15275/cardioit.2016.0301. Genkal EN, Korotin AS, Posnenkova OM, Kiselev AR. System of clinical indicators for patients with chronic coronary artery disease. Cardio-IT 2016; 3(3): e0302. Russian. https://dx.doi.org/10.15275/cardioit.2016.0302. Korotin AS, Kiselev AR. System of clinical indicators for patients with chronic heart failure. Cardio-IT 2016; 3(3): e0303. Russian. https://dx.doi.org/10.15275/cardioit.2016.0303. Received 10 October 2016. Accepted 15 November 2016. © 2016, Gridnev V.I., Kiselev A.R. Gridnev, Vladimir I. - Kiselev, Anton R.